Abel Landscaping Widnes. We specialise in all aspects of landscaping including Driveways, Paving, block paving, patios, paths, natural stone, Marshalls landscape products, water features soft landscapes like lawns and garden decking. We believe that all the work we carry out is of a very high standard. 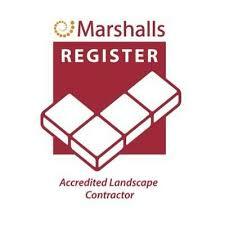 We are a Marshalls Registered company which means that we are continually vetted by them to ensure our standards match their standards. As we are on this register of approved contractors, we can offer our customers a 10-year guarantee on any Marshalls products that are installed on their project. ”Marshalls have a wide range of products from natural stone setts to concrete block paving to transform your driveway. We have a team of very highly skilled men who carry out work such as driveway installations, garden makeovers, bricklaying, conservatory bases and even extensions! Block paving, garden paving and timber services like garden decking and all aspects of landscaping. Abel Landscapes are customer focused so if you have a set budget in mind, we will make sure that our designs match your budget. ⇒ Landscaping Widnes: We carry out many all aspects of Landscaping in Widnes. Including hard and soft landscaping. We are experts in garden design and construction. ⇒ Driveways Widnes: We design and install many different types of driveways including tarmac, block paving, gravel and natural stone driveway paving or cobbles and setts. We are experts in driveway drainage solutions and creating a difference we can add a bit of driveway landscaping for the finishing touch. ⇒ Brick Work Widnes: We carry out many brickwork services in Widnes. This includes garden walls, decorative walls, retaining walls, conservatory bases and house extensions. ⇒ Decking Widnes: We install timber decking, Timber handrails, Timber screens, Pergolas and fencing. We also design, create and install any timber feature in a garden.